Save Today - pay only one fee for delivery when you add a mattress to your order. We only use 100% solid wood for all our beds. Any finish is available for any bed design. Choose the appearance between softwood or hardwood. Our hardwood options are finished to allow the natural grain to stand out whilst our softwood is solid premium grade Scandinavian pine treated with a variety of colour satin stain options or a natural appearance. Low Beds are modern, simple and subtle in their style and the Low Oriental Bed is no exception in our wooden bed range. 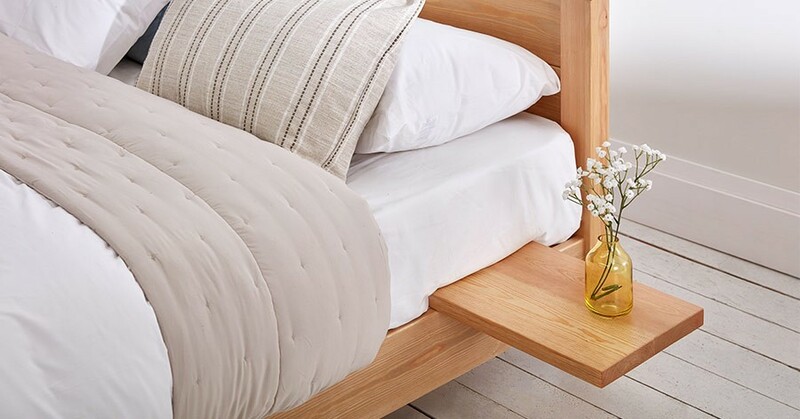 The naturally elegant low wooden bed frame is designed with clean lines and a minimal appearance that makes it ideal for any bedroom, and perfectly compliments your chosen decor. With this low bed having only a small minimalist headboard, the Low Oriental Bed frame still offers head support whilst ensuring it remains low in its overall design. The stunning contemporary design and its low height is popular for creating a spacious feel for any bedroom. The Low Oriental Wooden Bed enables you to instil a balance of an oriental feel with a modern aesthetic. The low bed frame is a great choice for any situation where ceiling height must be considered, such as loft and attic bedrooms. The Low Oriental Bed is designed to be a perfectly snug fit in spaces just like this. Made from sustainable Solid Scandinavian Pine, or Solid Hardwood for a maximum natural look, the wooden bed frame is carefully crafted by our experienced craftsmen here in the heart of the UK. 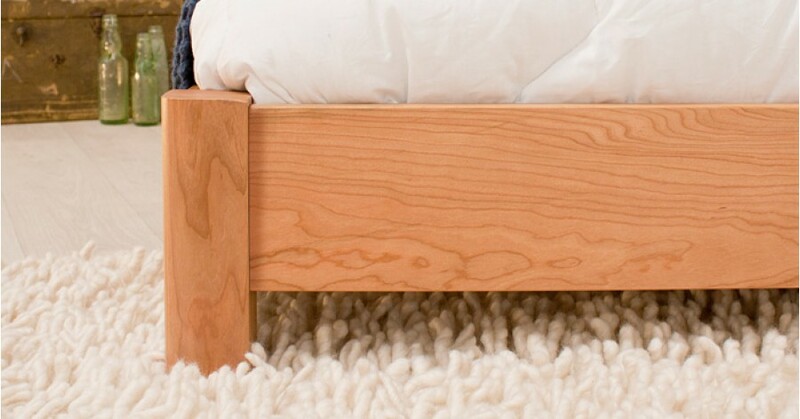 The solid wooden bed is made using traditional Mortise & Tenon joints for extra strength. The thick timber slats provide a strong base that is suitable for the heaviest of mattresses, all of which is discreetly placed in the inside of the wooden bed frame. Customise the platform of your wooden bed frame to create exactly what you desire with our range of paint finish options, hardwoods, curved corners, felt pads and further custom made offerings. As all of our wooden bed frames are handmade to order here in the UK by our experienced bedmakers, there is the option to change the height, length, width, and almost any desired change you require, which is perfect for custom size mattresses. Your Low Oriental Bed frame is also available in a wide range of wood stain colours with the most popular option being the modern black bed with a smooth satin stain as shown in our photo. All our wooden bed frames are flat packed in long thin boxes for ease of delivery and assembly, enabling you to move the bed into the tightest of rooms. 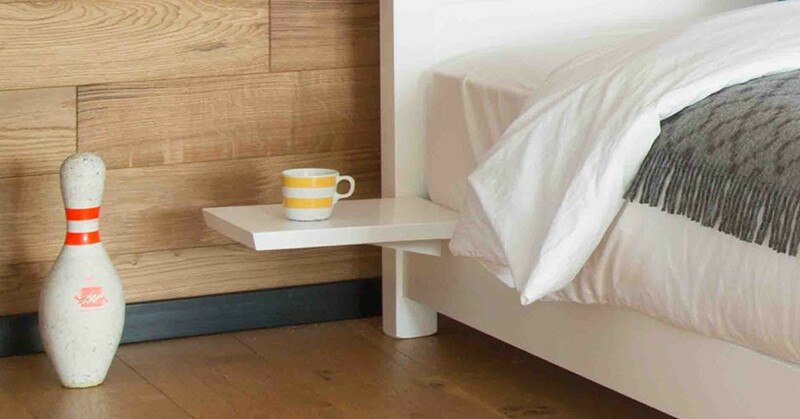 This is great for rooms that are normally tricky, and lets you effortlessly move the bed up spiral stairs, attic and loft ladders, or any difficult to get to bedroom as they are also carefully designed to be lightweight. Because of the popularity of this bed design, we also offer our Space Saver option, see the Low Oriental Bed (Space Saver) which has a smaller frame size for those tighter spaces, with the mattress sitting on top of the wooden bed frame. However, if you are looking for the same modern and sleek design but with no headboard, take a look at our Low Platform Bed which offers just that. Both of these high quality handmade wooden bed frames are part of our customer-favourite Low Bed range, designed for ease and your comfort. Please note mattresses, bedding and underbed storage boxes are not included with the bed frame. These can be purchased separately.